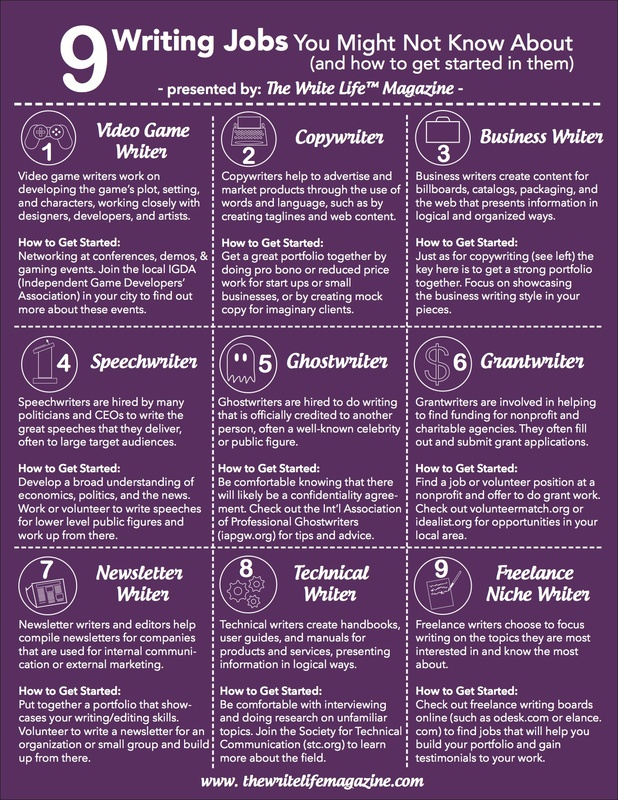 A blog I follow on Tumblr (phantasmagoricwicca) posted an infograph from The Write Life Magazine that I truly love, because it illustrates something that a lot of people don’t know: you can make a living off of writing by working jobs that you might not know exist. From ghost-writing to copy-writing to technical writing, there are many ways that you can follow the dream of writing even if you haven’t been able to get your novel out onto paper. Writing is an important skill used by virtually every industry out there — all you need is to know where to look! So, to help out any aspiring writers out there who also need to make some cash, take a look below (or click this link here to view the original). Good Men Project call for submissions! The Good Men Project has a call for submissions from now until June 29, 2013 on topics dealing with men and fashion! All submissions are welcome — even if it only obliquely fits the topic, the editors will be glad to at least take a look. I’ve worked with them before, and they’re really great people with a really great mission. If the clothes don’t make the man, do they at least signal what kind of man wears them? If clothing were nothing more than protection from the elements, it wouldn’t matter what we looked like, attired to appear in public. We would wear trash bags, Speedos, togas, bike shorts, no shoes, nothing but shoes, no shirts, or nothing at all, depending on our destination and the weather. It wouldn’t matter if our socks matched one another. There would be no notions of “appropriate attire,” “casual Friday,” or “black tie.” Clearly, this is not entirely the case. What are the truly important rules for wearing clothes, for guys who don’t care about fashion? What will you wear—and what would you never wear—on a date, a job interview, to go fly fishing, on a long drive, to meet your partner’s family for the first time, around the house with your kids, or to a funeral? How have you educated yourself on what to wear? What do you notice about the way other men dress? How do your clothes reflect your values? Do you shop for your clothes online? In second hand stores? Write some pro tips for the rest of us. Where do you come down on boxers vs. briefs vs. boxer briefs (vs. commando)? Is looking good part of good citizenship, being a good man, etiquette, or well representing your employer, church, fraternity, or team? Do you take no responsibility for buying or selecting the clothing you own? How well do your clothes express your personality? How do you see yourself, and how do you think others see you? How much does it matter? Do you wear a difficult to find clothes in your size, have a disability that makes it difficult to shop off the rack, or for some other reason find it difficult to find clothing that fits your body? What is your particular challenge, and how do you manage? How do you find clothes that are comfortable, attractive, durable, stylish, and a good fit for your personality and lifestyle as well as body and budget? How does your self image affect your ability to shop for clothes? Do you ever engage in “shop therapy”? Do you advise anyone else on style, or buy clothing for anyone in your family? Do you have a clothes shopping buddy? How do you respond to the stereotype that caring about clothing is feminine? The Good Life wants your articles and stories about men’s clothing. Send your ideas and drafts to Justin Cascio by email at justin@goodmenproject.com. Final submissions must be received by Saturday, June 29 to be considered for inclusion in the upcoming series. For questions and further guidelines, email Justin. If you’ve got something related, or can come up with something on the fly, shoot Justin an email!